Hi, my name is Stuart Atkiss. I’m 35yrs old and live in Dudley, West Midlands with my fiancèe and 6yr old son Taylor, who has Ectodermal Dysplasia. When Taylor was diagnosed with the condition, we were told to get in touch with the Ectodermal Dysplasia Society to find out more information about the condition. Well we did just that and the information and support given was second to none. Nothing was too much as we had loads of questions and concerns. As a family we attend the Christmas parties which the Society organise. The Christmas party is a great opportunity for their members and families who have Ectodermal Dysplasia to get together to be able to meet and talk, we soon realised this is a great team. Since finding the ED Society I have organised and taken part in a few fundraising events as we found out the Society relied mainly on fundraising to get funds to help continue their support families. I am now the fundraising co – ordinator, and when I was asked if I’d like to also become a trustee, it was not a hard decision. I wanted to be part of the team to help, and I love it. Families can get in touch anytime if they wish to do a fundraiser and want any ideas, or even just a sponsor form. Over the last couple of years, I’ve been doing lots of different fundraising events. I held a Masquerade Ball in my home town which helped to raise £1700, took part in bike rides from Wolverhampton to Aberdovey the last few years and raised over £5000. Im now well under way with training for the 2019 London Marathon, which I’m so grateful to the ED Society for giving me the place. 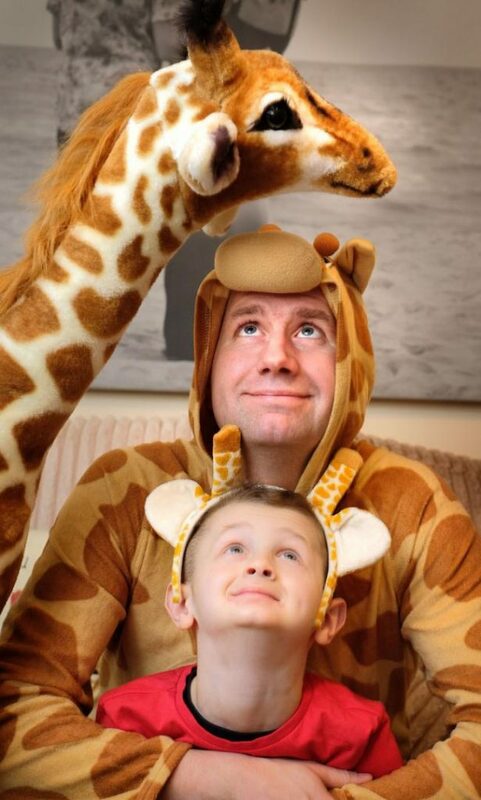 In tribute to my giraffe mad son, I will be running the marathon in a giraffe costume. All I ask is, can you help? You don’t need to run marathons or ride 100 miles on a bike, you can do anything you wish! Cake sales, small park runs, donations not matter how big or small, or through your own work. Just remember how ever little it will still raise money for such an important cause.